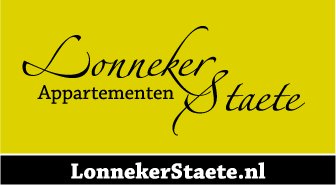 In the middle of the lively centre of Lonneker, situated in the heart of Twente, eight luxury apartments are available to you. These apartments have been fitted with all comforts and can be rented for a short period (weekend or midweek) or for a longer period. It is a perfect location for exploring this remarkable part of Twente or it can be a temporary (professional) location in the heart of Lonneker, situated right between Enschede and Oldenzaal as well as, of course, near Almelo and Hengelo.